Disclaimer: I am not Irish. However, it’s that time of year when green is everywhere, and it should be here, too. This cake, which was featured on TheKnot.com, is lovely, isn’t it? 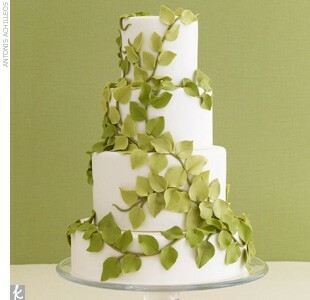 A simple, flawless white background, with sugarpaste leaves and vines meandering over the four layers. No embellishment, no topper needed. This would be the perfect wedding cake for an outdoor woodland wedding, a bride and groom that favor different shades of green for their celebration, or as a visual statement of “green intention” for the environmentally-minded couple.